Run Boy Run – The Small Things. Those of you who keep up with my little blog probably know that I am gearing up to run my very first 5k at the beginning of May. This is a very big deal for me because running (or any type of athleticism for that matter) is not something I am “good” at. One of my new years resolutions was to change that by challenging myself, so I signed up for a 5k. Since late January, (when I signed up) I have been making an effort to train. People who run on the regular might think it sounds silly to need to train for a small 5k, but I am the definition of a beginner and train, I must. Also I want to make sure that I can enjoy my race experience and not feel like death by the end. 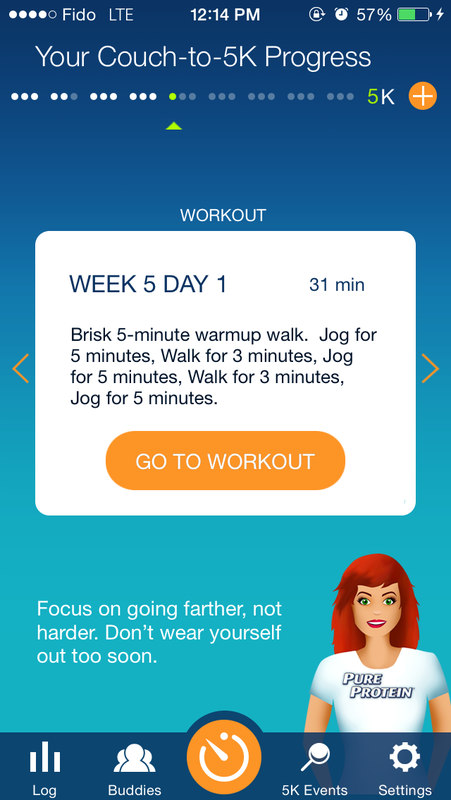 So I’ve been training with an iPhone app called Couch to 5k. It is exactly like it sounds it, going from nothing to something. The format is this: 3 runs a week for 10 weeks. 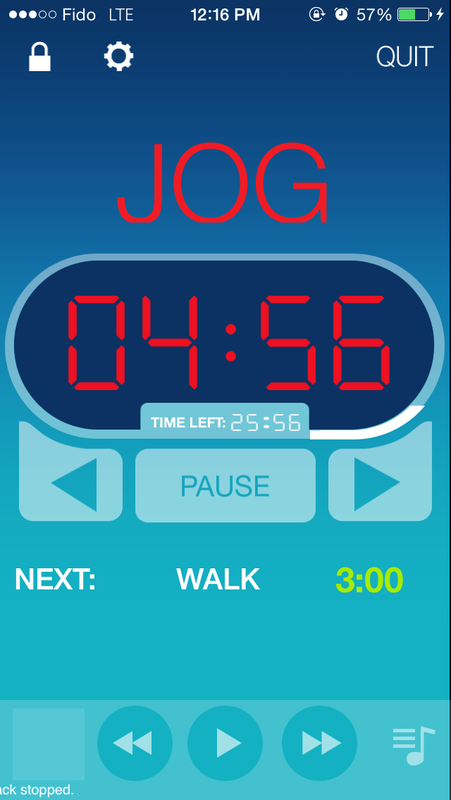 For the most part the runs are timed intervals, alternating between running and walking. Each week the running time gets longer and the walking time gets shorter. I am so pleased to share that so far my training is going super well. Obviously some days are better than others but I am managing to increase my speed and distance while following the timed intervals as indicated. As someone who suffers from asthma, keeping control of my breathing is one of the most challenging parts of running for me. I must constantly focus on in through the nose and out through the mouth if I want to be able to keep going. I have found that music with a heavy beat helps me stay focused on a regular breathing pattern. This week the first run looked like this [5 min warm up walk, 5 min run/jog, 3 min walk, 5 min run/jog, 3 min walk, 5 min run/jog, cool down]. The first two runs/jogs went well but the last 5 minutes was exceptionally difficult. Surprisingly the difficulty was in my leg muscles. I think I have finally reached a place in my training where I have figured out how to breathe and manage my asthma (which has been my biggest problem in the past) and so my leg muscles are finally being pushed and challenged for the first time. I am thrilled that my body is finally starting to benefit from the training! Usually my lungs quit long before my legs feel remotely fatigued, so reaching this point is a huge accomplishment! Way to go lungs! That being said, I still have a long way to go. Due to Canada’s never-ending winter, it is too cold for my asthmatic lungs to do vigorous breathing outside. Therefore I am stuck inside on the treadmill. Obviously the treadmill training is working/helping/making a difference but it isn’t comparable to running on pavement. Treadmill running has forced momentum. By this I mean that whether you like it or not that track is going to spin and you just need to keep up. Whereas outside the momentum is all you. I expect that when I start running outside my muscles will become fatigued faster and that I will run at a slower pace on average. That is okay with me, the main goal is just to finish the race, but I if I can do a decent job at the same time that would be nice. I am hoping that spring will spring into Toronto soon. I’d like to get at least two weeks of outdoor running under my belt before the race day. Anyway, that is my progress update. Check back in a few weeks to see my progress & to see the result of the 5k event! Maybe I’ll get one of those cool running action shots! Have you ever run a 5k? Got any good advice about training for a run? Share in the comments! PS. The title of this post was inspired by this great song of the same title by Woodkid. The video is rather dark but it has a great beat. Check it out! ← The Kind of Rain. Congrats on taking the hardest step in running: starting. If it’s of any consolation, it will become easier with time. I was born asthmatic, am hyper-allergic to cats and pollen, and suffered annual bouts of bronchitis (plus pneumonia once), but over time, running has actually reduced my attacks, eased the allergic symptoms, and this year, I spent my first winter bronchitis-free. I so agree about the music! I try to constantly update my playlist so that it never gets old. Thank you so much for your support! I am very excited but also super nervous and that is pretty good motivation. Thanks for reading! Although I’ve been an athlete most of my life, I just recently started running on my own & did my first 5k at the end of last summer. It was awesome! The most valuable advice I got, and will pass on is to not get too excited at the start line the day of the race. What I mean is, don’t go out too fast. Mentally, I try to start a race the same way I would on a causal run. It’s better to have some juice left on the last mile, than kill it on the first mile & have to suffer through the last 2. Especially on “fun runs” people will generally start out very fast. Ignore them, and do you! Thank you, thank you, thank you! That is a fantastic piece of advice and something I hadn’t even considered. I hope that once I get outside, running on pavement, I’ll get a better idea of what my natural speed is and what my faster speed is. That being said, I would definitely pick up my pace if I felt like I was lagging behind at the start. So it is good to know that people generally start too fast. Thanks for the great advice! Before I started running, I had a friend tell me that it took them a month of consistent jogging before they didn’t dread the “out-of-breath-tiredness” pain. That took the wind out of my sails and I put it off longer. I shouldn’t have done that. It’s true about the time, but everything that is hard is usually worth working through I’ve found. Kudos to you for doing it! I definitely agree with your friend. I think part of it is physical, in that the better and more fit you get the easier it is to battle that feeling. But I also think part of it is mental, because at the beginning that pain seems impossible but once you get through it once it seems a little less like death. I think the bigger the challenge the bigger the reward. So hopefully this will end up being a very positive and rewarding experience for me. Thanks for the support!